I read this article and found it very interesting, thought it might be something for you. 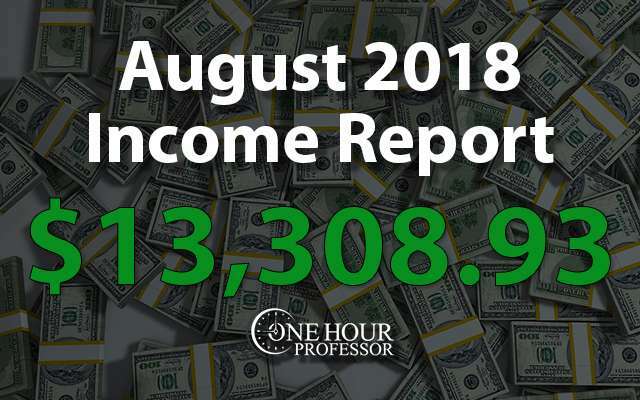 The article is called August 2018 Monthly Income Report and is located at http://www.onehourprofessor.com/august-2018-monthly-income-report/. 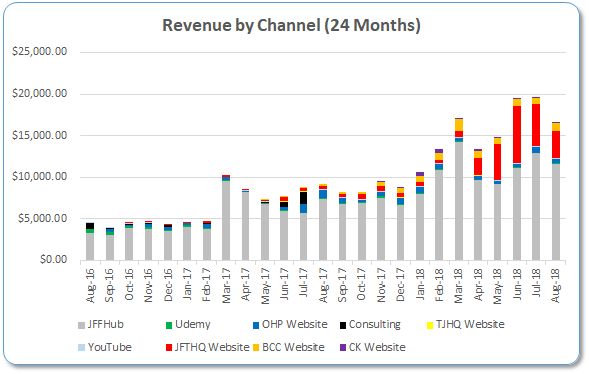 August was the fourth best month I’ve ever had for my online business and though I dealt with a 16% drop in revenue, I’m still pleased with the results. I mentioned in my July income report that I expected something like this to happen, and now that the month is over I can see that my assumptions were correct. In the month of August, I was still able to make an average profit of $429.32 per day after expenses. This is a pretty big drop from July, but I’m still making a good buck for what I do and refuse to let it get me down. I lost some traffic on the JFTHQ website, but found a way to better monetize and reduce those losses. I hit over $100k as an annual income for 2018 in the month of August. August was quite a busy month from a personal perspective. My wife and I had a trip planned to New York and then decided on a last-minute Vegas trip as well. Both places were a ton of fun and we really enjoyed ourselves on these vacations. My highlight for the New York trip had to be seeing the statue of liberty in-person as you can see below. Not too shabby, New York. Not too shabby at all. For Las Vegas, I had two favorites. Grand Canyon view from our helicopter ride this morning. It was a good way to start the day. From the “High Roller” wheel at LINQ. Pretty awesome view of Vegas from here! Aside from that, another cool thing that happened in the month of August is my mom moved back from California. My parents got divorced about five years ago and right after it happened, my mom made a decision to move away. I personally think this was just a time to heal for her, but I’m glad to see she was willing to come back to Illinois and now we have the family together again, even though my parents are separated. In addition to that, I’m also very excited because my wife’s application for her green card came through and was accepted. This doesn’t mean that she’s a resident of the United States yet, but it means that we have to do some interviews and then she should be granted the green card. If all goes well, it looks like she could be here permanently by the end of the year. This is great news because it’s getting really annoying to have to have her come here for a month or two and then leave for the same amount of time. Once this all goes through, we’ll be able to spend all of our time together like a normal family and we’re also going to be in the market to purchase a new home. When we actually make that purchase, I’ll post a few pictures so that you guys can see it for yourselves. 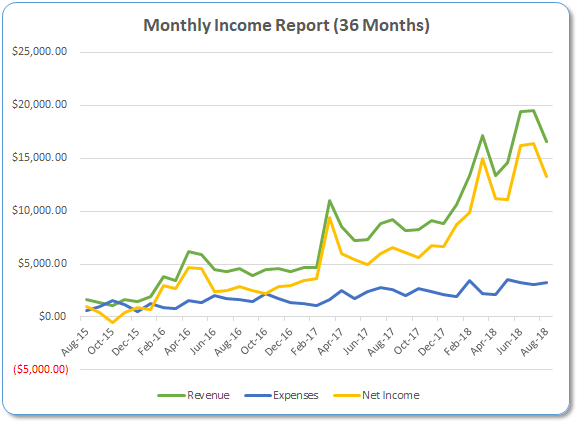 Thrive Themes Affiliate Income: I’m not really sure exactly why this happened, but my income in this particular channel fell by about 80% for the month of August. This is strange because it’s just affiliate income that is generated by various pieces of content, but for some reason it really didn’t do well in August and my content is in the same place it always was. I’m hoping that there will be a natural correction here and that there’s nothing seriously wrong. I personally don’t think that there is and it was just variance, but only time will tell. JFTHQ Overall Revenue: There was a drop-in income on this website for the month of August. The total drop was about 35% and though that hurts, I’m happy to see that it’s still generating something. I get into more details about why I think this happened in the JFTHQ project update below, but it was a combination of different things. Freelance Research and Labor: I actually expected my expenses to drop for this month, but that definitely didn’t happen. I blame it on the fact that I had a few random development things come up and also hired a lot of different people for projects that I’ve since cancelled. Full Portfolio Update: Overall, I’m still happy with everything that’s been happening in my online business. The last few months of earnings was surreal and it feels like this month was a correction to reality. The summertime created a spike in demand for one of my websites and now that this spike has receded, I’m left with, what I think, are normal numbers. While I’d love to be hitting almost $20,000 a month in revenue consistently, and I’m sure I’ll eventually get there, unfortunately this isn’t the new normal as I was hoping. But it’s okay, I’m still making a heck of a lot of money and definitely more money than I would make at a full-time job so I’m not going to complain. JFFH Update: There was a reduction in revenue and traffic for the month of August and from what I understand, this is normal. I remember hearing on a podcast how the month of August is one of the slower months for websites in general because most people are trying to enjoy the weather and don’t spend as much time online, but I’m hopeful that this will pick back up in the month of September. I really don’t have any updates for this project. I’m starting to struggle with content that I want my blogger to write because we’ve written so much over the last few years, but I’m going to do my best to continue to find new topics to write about. Consulting Update: No consulting to report for the month. Udemy Update: Made almost $100 for the month with completely passive income and have no intentions of doing anything more on this platform. That said, I’ll never complain considering it still pays me and I haven’t created a course in over a year. OHP Website Update: You may have heard of the “medic” update, or maybe you didn’t. Long story short, this is an algorithm change that is supposedly focused on checking the expertise, authority, and trustworthiness of the writers who are behind websites publishing content. This usually wouldn’t be a big deal, but two of the areas that were hit really hard by this change were medical websites and financial websites. That said, changing OHP to a financial website might not make all that much sense anymore and I need to discuss this with my potential partner. At this point, I’m in a holding pattern until she contacts me to move forward. Last month I decided that in order to fix the downswing the website was experiencing I was going to build more content and create more back links. Truth is, I haven’t yet assigned new content ideas to a writer because I’m still trying to figure out exactly what that content is going to be. I have a good idea of some topics, but I need to make sure that it will actually work before I hire someone else. In terms of the backlinks, I did launch a backlinking campaign towards the end of the month but have yet to see any results. It’s okay though, my hope is that in the beginning and middle of September I’ll start to see some positive signs of people interested in linking again. This website has had some issues because it’s seasonal and it also lost some rankings. This is a very competitive niche that the website is in and while I’m frustrated by Google’s constant shuffling of the search results, I think if I continue down the path that I’ve been on I’ll eventually do really well in this market. Right now, the website is still making a respectable amount of money which should help me fuel the growth for the future. Aside from earnings, I’m still focused on a guest blog post link building campaign here and have had about 10 placements because of it. There is still room for improvement with this, but I’m happy to see some success. Pageviews dropped (again). I believe at this point is that the website is kind of stagnant and not will not continue to trend downward. If they moved me up in the search results, that’s obviously a welcome correction, but I think for now I’m kind of stuck with my current rankings. Earnings also dropped for the month, but if I’m able to pull in $3000 a month from this website that’s still a pretty good amount of money. Again, this website is completely passive at this point. I don’t even publish new content and for some odd reason, the amount of income that I made from this website jumped quite a bit in August. I’m not sure why that is, but there was a small increase in page views and I’m sure that they are somehow related. I have another calendar to make for this website and intend on doing it prior to the end of year. If you recall, I did this in the beginning of this year and it was pretty successful considering I launched a 2018 calendar in February. I think we have a proof of concept because I broke even on the first calendar and it makes sense for me to invest to sell a 2019 version of the calendar. In the near future, I have to collect images for the calendar and get everything printed and set up for the holidays. The fact that I’ll be able to launch the calendar before the holidays is going to be a big deal as I wasn’t able to do this with my last version of the calendar, but an even bigger deal is that fact that I’m also going to write a blog post that will hopefully rank me number one in Google for the type of calendar that I’m trying to sell. The idea is that I’ll control the number one result in Amazon for this type of calendar (I already have this spot) and I’ll also be able to have the number one result in Google. Obviously, that’s a lot of potential people between the two sources to purchase the calendar and I’m hopeful that I’ll be able to capitalize on it. Beyond that, I also have an idea of a product for this particular website that I’m going to sell on Amazon. It’s going to take some time to figure everything out and I’m not in a position to do this right now, but I definitely found a product that there is a need for and many people say there is also a need for improvement. While I’m not sure if I’ll be able to create the perfect product, I am sure that there is a need and I intend on filling that need. I’ll report more on this when I have more details in the future. This website is small but mighty. While it isn’t making as much of some of my other projects, it also took a lot less work to create and is growing very nicely. It’s my first true test creating an affiliate website and I’m very proud to say that it’s gone well. I’ve considered selling this website multiple times because it’s such a small niche and the growth is limited, but I realize that I’ve already got something that is the #1 authority on the Internet for this particular niche so instead of selling it, I need to dig further into monetization and creating a product on Amazon is the way to do that. Another month down with the CK website and it’s still struggling. I was happy to see that the page views increased by about 12% for the month and that’s definitely a positive sign, but it’s still not where I want to be. My hope is that this website continues to trend upward as myself and my team worked hard to drive more back links. I still see enormous potential in this particular market, but Google isn’t showing much love just yet. Database link building: This is when I create a database of information and then outreach to the people in that database to see if they’re willing to link back to me. Infographic link building: This is when I create an infographic and then request links from other sources linking to that particular page. While I’m confident that I have a great infographic and the right audience, the amount of links and I’ve gotten are non-existent. I changed the messaging a little bit in my outreach campaign and hope in August I’ll get a better response rate. Beyond these two campaigns, I’m also considering a link building campaign around broken links and also resource pages. With this particular website, I think the only way that I’m ever going to do well is if I have 500+ different websites linking to me and if I continue to link build for months on end, eventually that’ll happen. Aside from link building, the one thing that I discovered is that I’m able to very simply and easily insert ads all across different category pages on my website using the ad inserter WordPress plug-in. I wasn’t aware of this before and used to have my virtual assistant do everything manually, but knowing this now, I think that I’ll be inserting ads into this website again in the month of September. Hopefully this will give a little spike to the earnings and give me a reason to be excited about this website again. Because, as of now, it’s been like trying to build a brick wall by hand. Some websites take a long time to pop and this is one of those websites. It’s been exactly one year since I created this asset and it continues to drag and shows almost no signs of positive momentum. But it’s okay, I think I just have to be a little bit more patient and wait until Google decides to show it love. Seasonality should always be a factor: One of the things that none of my other websites have experienced before was seasonality. The JFTHQ website is now experiencing this and it’s something that’s new to me. That being said, whenever you’re creating a website make sure that you think about seasonality and if there’s going to be spikes during certain times of the year. It’s something I haven’t had to think of before, but this website is making me realize sometimes that can be a factor. Perspective is key: While I’m not necessarily happy that I’ve seen a pretty strong reduction in earnings this month, I try to keep in mind that it’s my fourth best month ever and I’m still making a good buck doing something I love. Keep Calm and Persistent: When you’re in online business, downswings happen and you need to be ready for them when they do. Whenever I start to see negative things happen, I tend to reflect on what it is that causes those negative things and remind myself that my strategies got me to this point. I just need to keep on track and continue doing what I’m doing to succeed and this will all work out in the end. I’m confident in stating that most people would’ve given up on the CK website by now, but I have all the faith in the world that it’s still going to become a successful project once it gets the love that it deserves. I spent time cleaning up 404 errors on my portfolio of websites in August and while I’m not sure that it made any significant changes in the search results, it definitely makes me feel better. I was able to leave the Disqus commenting system and went back to the WordPress default commenting system. The only downside to this is the fact that all of my previous comments were deleted because they were tied to the other platform, but it’s something I absolutely had to do. I was able to begin link building to JFTHQ again, but no one has agreed to link to me just yet. I mentioned this in the introduction, but I haven’t done this yet only because I’m trying to figure out exactly what topics I want to have written. I have some ideas and think I have some topics that’ll make sense, but need to give it a little more thought before I have someone start writing. What Are My Goals for September? I’ve already started on this one a little bit, but in September I’d like to build even more links to the website utilizing guest posting and resource page links. It really hasn’t been easy to get links to this website but they do still happen and I need to continue outreach to continue to grow. This was a goal in August that I failed, but I have no intention of failing it in September. I may just start with one blog post a week as I don’t want to throw a bunch of money at this website, but it should pay off once I’ve found the right keywords to target. The CK website has been dragging for quite a bit but it’s starting to show some signs of positive trends. That said, it’s time to launch ads on the website again in an effort to further monetize some of the traffic. I’ll be careful to not overdo it with the ads, but I think that I’ll be able to balance the user experience and ad revenue pretty well for the pages and I need to focus on. Interesting suumary and analysis again. I lean so much from it. Just one thouhgt that came up: on the JFFH site you have 73% of income frm Adsense. It works well, but seems like you have too many eggs in ne basket. Are there possibilities to increase the other income streams without harming your Adsense income? what is jffh website address ?